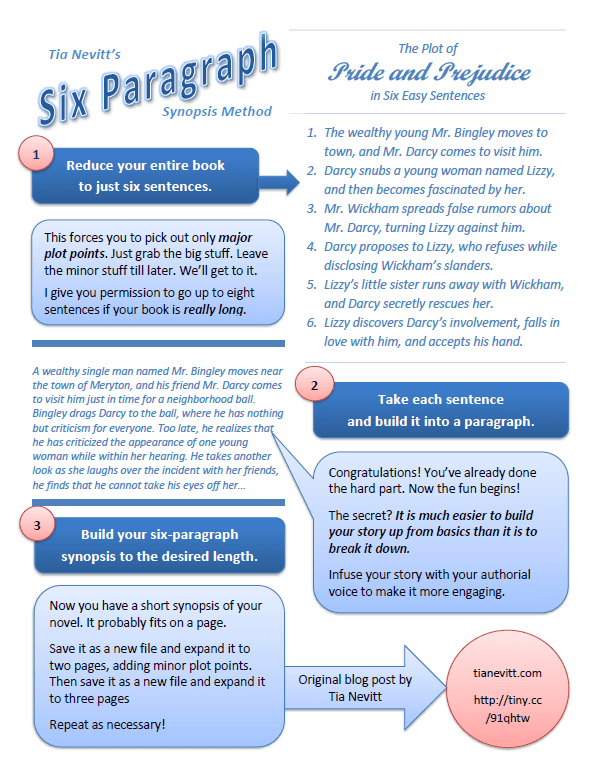 Six Paragraph Synopsis Method – The Infographic! A while back, I wrote about my Six Paragraph Synopsis Method. I still use this method to this day because it takes synopsis-writing from a dreaded task to something I enjoy, along with query letters. I shared it with you because I remember struggling with synopses not so very long ago. Inspired by an infographic I saw on GalleyCat, I decided to do an infographic of my own. Enjoy! Linkage, tweets and shares appreciated! You have not missed a large number of posts. I am only able to do guest posts twice a week or so. May I say as a business analyst this looks like an awesome and creative way of using traditional business analysis techniques to start a story. I recognize the high level requirements (6 sentences) and then the process to use them to create more and more detailed requirements. I love it! I guess you can tell what my day job is! Thank you! Useful. I love the infographic format and concept. Sometimes, I write the synopsis first, but Iike most writers I’m a visual person so this infographic really helps. Thanks so much. Glad it is of use to you guys! I’ll have to apply the business analysis method to the query letter next!